Tonight we are going to review a white wine blend from the Epanomi region of Greece – White 2016 by Ktima Gerovassiliou. The winemaker’s philosophy is to constantly research and experiment with greek grape varieties in order to produce high-quality wines which exhibit all the distinctive characteristics of the Epanomi region’s terroir. 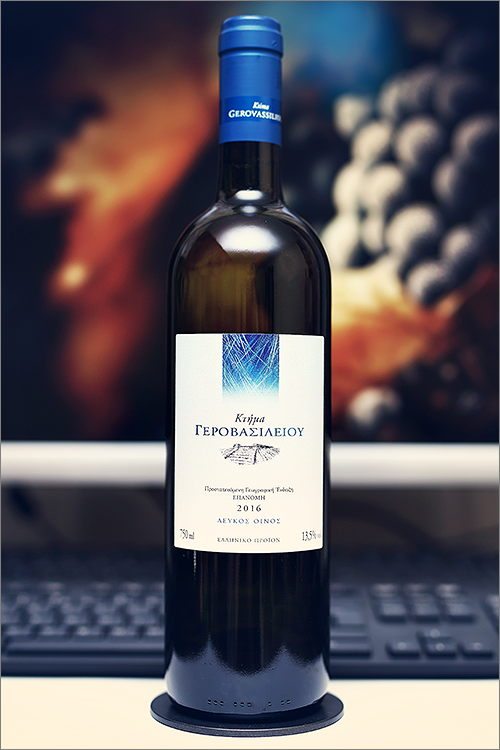 This wine is a blend of two greek indigenous grape varieties: malagousia, which forms the wine’s main structure and assyrtiko, which brings acidity and local terrior notes to the final blend. But let’s get rid of the theory and move on to the tasting! Clear green color with topaz-yellow hues towards the rim of the glass. The nose is strong, filled mostly with herbal flavours: wormwood, gooseberry, green pear, currant leaf, green grass, moist wood, yellow apple, quince, camomile, green apricot, acacia, margaret, green tea, jasmine, hay and some nuanced notes of chalkstone. The wine is dry, with high alcohol level, high acidity and firm tannin. This is a crisp, supple and quite woody wine with a nuanced herbal-mineral profile. It tastes green, a bit rough and angular, with a fair overall balance and a very lean and wide mouthfeel. The wine feels just a bit off balance yet herbaceous and aromatic. It has a long finish and a balanced, crisp and mineral aftertaste. This is definitely a fine Wine of Greece and the overall rating says the same, with 90.5 points scored it is right there, among the best wines we’ve tasted so far. Please click on the chart icon on the left in order to get to the wine rating page, where you can find all the wines we’ve tasted to date. Conclusion: this is a very fine white wine blend that has just passed the summit of its prime form – crisp, herbaceous and elegant. We would recommend to drink it now, as we could not detect any ageing potential – the wine has a green-tannic grip on the mouthfeel, which leads to a rough mid-palate, firming beautifully on the finish, where the nuanced minerality glide well alongside those subtle herbal notes. In order to complement the wine’s aromatics, we would suggest to pair it with seafood dishes that are rich in natural fat, like for example pan-seared mahi-mahi with lime marinade or sweet lemon shrimp. Cheers!